As head coach Jeff Houghtaling pointed out today, had his Lady Bulldogs’ Tuesday-night bout with the Class 6A Cavegirls of Carlsbad consisted of just the first and third quarters, the Artesia girls would have come out on top, 23-20. Unfortunately, the girls in orange didn’t fare as well in the other half of the contest. The beginning of the end came in the second, when the Lady ‘Dogs were outpaced 26-5. The Cavegirls then proceeded to close out a 30-point victory in the fourth, 65-35, to complete their sweep of this year’s Eddy County War series. Artesia used aggressive defense to limit Carlsbad in the opening eight minutes Tuesday, allowing four baskets inside and one from beyond the arc. The Lady ‘Dog offense, meanwhile, did its damage in the paint, as well, with a bucket and an and-one from Gracie Puentes, a baseline drive by Paityn Houghtaling, an a Kyrah Gonzales jumper keeping Artesia within a point, 11-10, heading into the second. There, however, things swiftly began to snowball. As the Cavegirl guards heated up, the Lady Bulldogs weren’t able to connect with as much success, and that 1-8 showing from the field combined with seven turnovers that gave Carlsbad a few easy buckets resulted in a 37-15 deficit at the half. “I thought the girls did a really good job overall of executing our game plan defensively,” Coach Houghtaling said. “I think where we got in trouble was we just didn’t match them shot for shot. The Lady ‘Dogs took the court with intensity in the second half, with Gonzales and Alexa Riggs draining back-to-back treys, and Puentes adding two from the free-throw line and one under the basket to bring Artesia back within 14. But that was as close as they’d come to bridging the deficit, as an Elisa Cardenas longball in the fourth once again marked Artesia’s only field goal of that period. Puentes led Artesia on the night with 12 points, followed by Gonzales with eight, and Carsyn Boswell finished with 18 for Carlsbad, 12 of which came in the second quarter alone. The Lady Bulldogs (9-8) will have the opportunity to finish out the week on their home court, as they prepare to host Alamogordo at 6:30 p.m. Friday and Ruidoso at 2:30 p.m. Saturday at the Pit. 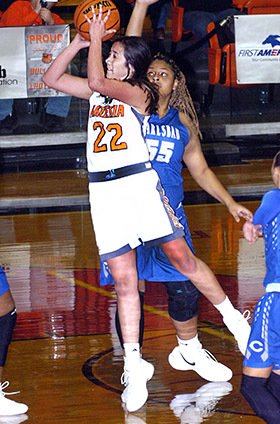 The Artesia girls topped the Lady Warriors 66-31 Dec. 7 in the first round of the City of Champions Classic. “I think Alamo could be compared to Los Alamos or Capital,” Coach Houghtaling said. “They’re probably going to play a tight man-to-man. I think we match up with them well in size, and they’ve got a couple of guards who give them the bulk of their scoring. They’re probably going to be the champs of that southwest district, so it should be a good game for us.